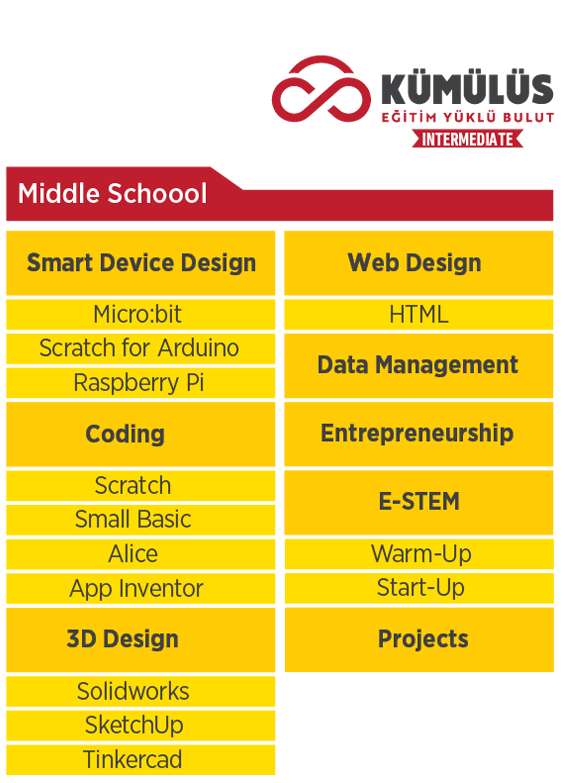 BG is an online education platform that gives information and skills in “Coding”, “Three-Dimensional Design”, “Smart Device Design and Coding”, “Web Design” and “Entrepreneurship” fields to the children 5-16 years of age. Students and teachers who access the bilisimgaraji.com online platform with their username and password can access 69 different lessons, including more than 15.000 multimedia pages. 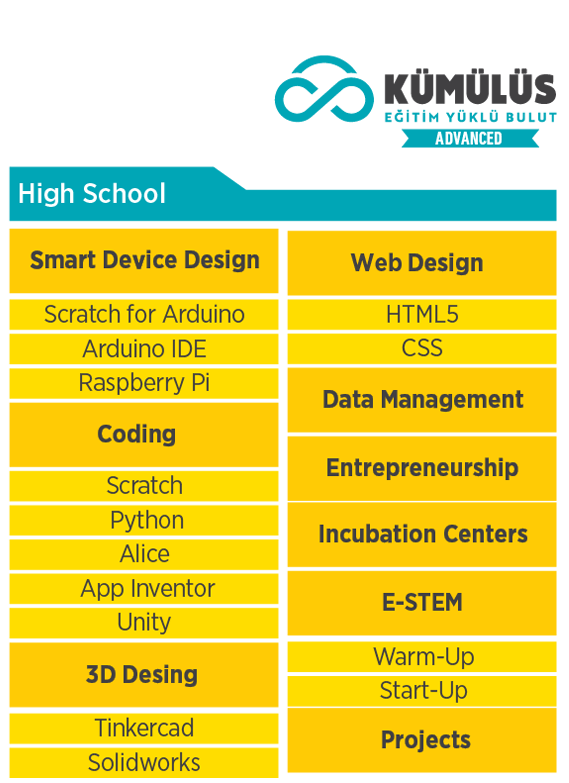 Courses of Coding, 3D Design, Smart Device Design and Coding, Web Design and Entrepreneurship are classified according to the difficulty level as introduction, intermediate and advanced level. Thus, an educational institution can provide informatics knowledge and skills to its students for 4 years. Introduced knowledge and skills can be combined with all other disciplines, with emphasis on mathematics and science courses. The student repeats the tutorials of the teacher. At level 1, the student discovers that there are some methods and tools to solve the encountered problem. The student makes the first attempt to apply the methods and the techniques. At level 2, the student realizes that the encountered problems can be solved in different ways by different methods and tools and he / she examines these methods and tools in more detail. Apart from repeating the teacher’s tutorials, he/she make some changes. At level 3, the student does not hesitate to try using different technical tools in software, hardware and design to solve the problems encountered. At level 4, the student associates the solution of the problem that he / she faces with the products he / she encountered and used in his daily life. At level 5, the student develops the solution of the problem, creative and critical thinking skills using mathematics science knowledge and carries the excitement of moving beyond the offered solution. At level 6, the student does not hesitate to take risks to develop his / her own products by using methods and technical tools that are not shown. The skills are gained to create what is dreamed. At level 7, the student takes the initiative to solve the problems he / she observed by blending all technical skills with other disciplines without waiting for any offered problem. At level 8, the student knows the steps that need to be taken to turn the brand new solutions into a social value and makes his first attempts to spread his innovation. How The Trainings Are Given? bilisimgaraji.com online platform provides 3 days of face-to-face training to the teachers of the collaborated institutions. Thus, informatics teachers will be learning the basic component of online platform Learning Management System (LMS) and multimedia contents and how to use the system in school. Schools without informatics teachers can select and send other branch teachers who are curious about the field of informatics and technology. In addition to the informatics teachers, we are raising awareness of what kind of projects they can produce together with the students who have the skill of ‘production with informatics’ with the 2-day E-STEM, coding in informatics, three-dimensional design and Smart device design trainings of the other branch teachers of the schools for the last 2 years. 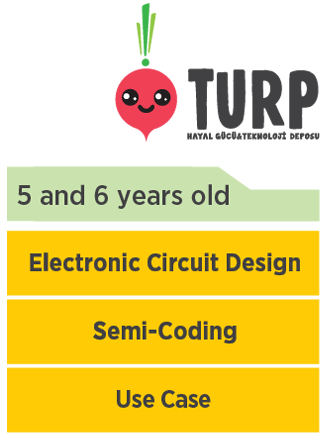 We inform teachers about how to use ‘semi-coding’, ‘electronic design’ and ‘three-dimensional design’ online contents that we developed specifically for this age group of students with the 1-day trainings we give to the kindergarten and first-year teachers.